Similar to the Halloween issue, for Yearbook Part 1 we are gifted three different stories with intersectional scenes in between written by Brendan Fletcher with pencils and color by Adam Archer, inks by Sandra Hope, and lettering by Steve Wands. Maps is dissapointed that they wouldn’t allow her on Yearbook (she has too many clubs already) so Olive gives her a scrapbook to fill her stories. 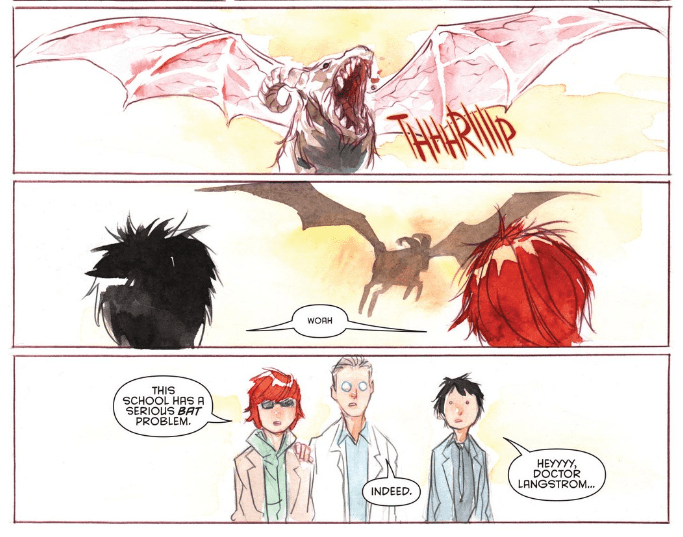 The first story is a classic Derek Fridolfs and Dustin Nguyen watercolor romp of Colton and his friend Eric trying to steal a sheep from Professor Langstrom during Prank Week. You can guess there are bat wings involved. The second story, written and drawn by Katie Cook has Olive and maps against the Glee Club’s brainwashing scheme. Maps saves the day with cat videos! Very cartoony. The third is perhaps the most interesting, a flashback story written by Hope Larson and illustrated by Kris Mukai about the girl’s teacher Isla Macphearson in the 1980s and how she befriends (and falls for) Toni, a metahuman who can disappear into people’s blind spots, who day is a supervillain assassin ‘La Pisada’ and someone Isla still loves. Very notable and totally natural. None! It’s cute. I’m excited to see who else they bring on board. Cute “non-issue” issue with some interesting revelations regarding Macphearson. Check it out for that story alone!